Can This Meditation Dome Change the World? I have a confession to make. I have been trying to meditate for the last 15 years and sadly, I have failed miserably. I've written numerous articles about meditation, signed up for every Deepak & Oprah Challenge, purchased guided meditation CDs, downloaded chanting music, received reiki sessions, attended group meditation classes and have taken yoga...all with the hopes that someday I would finally "get" it. I'll give myself an A for "Effort" but an F for "Completing My Assignment". Two weeks ago, our friend Tony started talking on and on about a new meditation pod (Somadome) he had seen at the Global Wellness Summit. I couldn't help but listen because he is one of the most innovative people I know and owns Gwinganna Lifestyle Retreat, an award-winning health and fitness destination in Australia. His excitement was intriguing but my skepticism was palpable. Still, I couldn't help but wonder if this dome might be the missing link in my quest for making meditation a part of my life for good. According to their website, the Somadome combines ancient healing practices with modern technology to promote stress relief, vitality, and mind/body alignment. 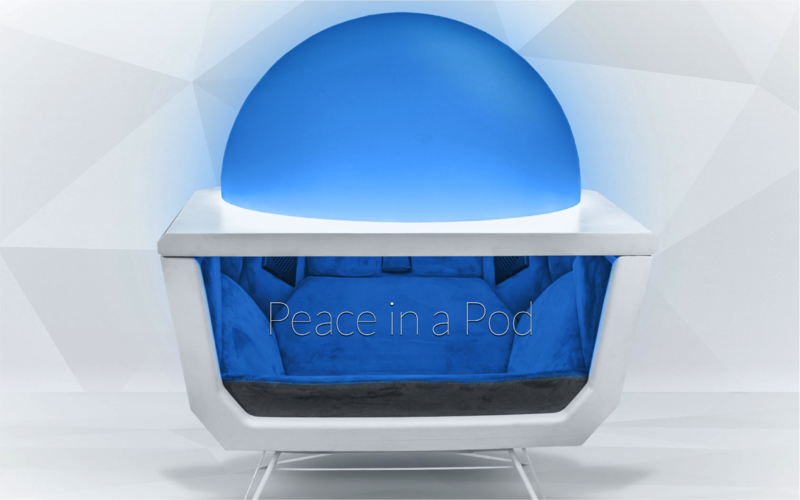 This "Peace in a Pod" combines LED Color Therapy (which relaxes the mind and body), Microcrystalline Tiles (which block harmful electromagnetic frequencies) and Binaural Beat Meditation (which helps guide your mind into the meditative state) in private 20 minute sessions. They offer a variety of programs (some with verbal guidance, others without) that you get to choose from. Being a competitive person by nature, I knew I had to try it but also thought that I would once again fail. I know that all meditation is good (even if your mind wanders) but I really wanted to experience the sense of calm and peace that is the result of meditation. I promised to give Tony my full report on it--the good and the bad--since he was contemplating buying some of them for his wellness center. After a quick search, I found a Somadome located just an hour away. As I drove there, I envisioned sitting in this futuristic looking pod trying to quiet my mind, but once again, letting the distractions of life take over. I started thinking about all the things I should be doing and I quietly began cursing myself for wasting all this time to drive to the spa. Boy, was I wrong. About 10 minutes into the experience, I "got" it. I felt the shift. It reminded me of the first time I looked at an autostereogram--a picture of dots that transforms from a two dimensional scene to a three dimensional image when you stare at it long enough. Learning how to let your vision "blur" so you can see the shift is the hard part. Once you learn how to do it, it becomes easy. I am hoping this is true for meditation too. My teacher, the Somadome, finally taught me how to meditate. I can honestly say I was blown away from the experience. And nearly two weeks later, I am still feeling the residual effects. Meditation affects both the physical and mental aspects of your health. According to the National Institute of Health, practicing meditation may reduce blood pressure, symptoms of anxiety, depression and insomnia. People who meditate regularly have more folds in their brains, which researcher say may allow them to process information better. And numerous studies show that meditation may slow, stall or even reverse the aging process of the brain. These benefits are just part of a much larger list of how meditation can change your life. But let's just focus on one health issue--anxiety--and how meditation can help ease that. According to the National Institute of Mental Health, anxiety disorders are the most common mental illness in the U.S. Anxiety affects approximately 40 million people 18 years and older. And what would that number be if we included kids 17 and under? Schools are filled with boys and girls who are struggling with anxiety. There seems to be more pressure on them than ever. There are many factors here: excess homework, learning disabilities, lack of proper nutrition, bullying, poor self-esteem, college applications, etc. But WHAT IF? What if we could teach children at a young age to meditate? How different would our world be? Imagine a generation of people who sleep better and have stronger immune systems, experience significantly less stress and depression, have increased mental acuity with better attention spans? And a wonderful side benefit is that they grow up learning to better appreciate life and the people in it. This may sound apocryphal to you, but I think it's possible. And it looks like the people at Somadome and HealthCorps (founded by Dr. Oz in 2003) believe it too. 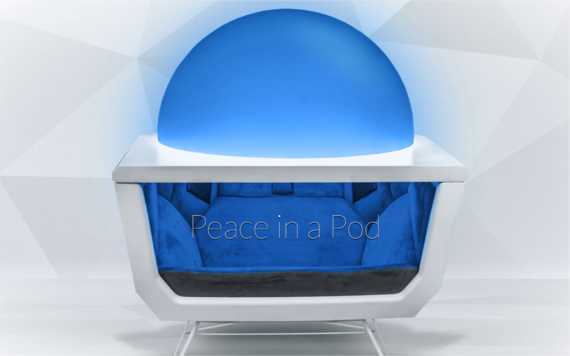 In 2012, "Pods for Peace" placed their first alpha prototype into the American Legion Continuation School in Sacramento, California to see if it could help some of their most troubled students. The students did a weekly Somadome session for 3 months. The qualitative data indicated a marked reduction in feelings of aggression, an increase in focus and wellbeing and attendance at school among the participants went up. In the not-too-distant future, I envision seeing Somadomes in office buildings, airports, fitness centers, hospitals, shopping malls, doctor's offices and schools. Yes, schools. I know that schools barely have enough money to buy books, but anything is possible. Anxiety disorders cost the U.S. more than $42 billion each year! How many Somadomes can we buy for $42 billion dollars? There are about 100,000 public schools in the U.S. You do the math. Less stress. More peace. Let's find a way to get there.